A recently discovered family of small RNA molecules, some of which have been implicated in cancer progression, has just gotten much larger thanks to a new RNA sequencing technique developed by researchers at UC Santa Cruz. The technique, described in a paper published August 3 in Nature Methods, provides sensitive detection of small RNAs that are chemically modified (methylated) after being transcribed from the genome. The researchers used the technique to reveal an abundance of modified fragments derived from transfer RNA molecules in both yeast cells and human cells. "Transfer RNAs are some of the most numerous small RNAs in all organisms, and it turns out that cells are just littered with little pieces of them. We discovered that many of those pieces are hidden from the standard analyses due to modifications of the RNA," said first author Aaron Cozen, a project scientist in biomolecular engineering at UC Santa Cruz. Senior author Todd Lowe, professor and chair of biomolecular engineering, said the method opens up a rapidly growing area of RNA research. "With our method, there is a more than three-fold increase in the overall detection of transfer RNA fragments," he said. Transfer RNA was characterized decades ago and plays a well-defined role, together with messenger RNA and ribosomal RNA, in translating the genetic instructions encoded in DNA into proteins. The discovery of RNA interference and genetic regulation by microRNA, however, revolutionized scientists' understanding of RNA's role in gene regulation and other cellular functions. Since then, a bewildering abundance and variety of small RNA molecules has been found in cells, and scientists are still struggling to sort out what they all do. "In the past five years, we're starting to see that transfer RNAs are not just translating genes into proteins, they are being chopped up into fragments that do other things in the cell," Lowe said. "Just recently, a subset of these fragments was found to suppress breast cancer progression." Transfer RNA fragments can be detected and analyzed using high-throughput sequencing techniques. But a critical step in the RNA sequencing protocol is blocked by certain RNA modifications involving added methyl groups, and these modifications are prevalent in transfer RNAs. The UC Santa Cruz researchers and their collaborators at the University of Rochester School of Medicine developed an enzymatic method that removes those modifications before sequencing. To make the method more powerful, the UCSC team developed a computational analysis of the sequencing data that they could use to identify and map specific modifications and see how common they are. They used this methodology to accurately predict previously documented transfer RNA modification patterns in yeast. Applying the technique to human cells, they were able to document a large number of previously unmapped modifications. "In the human genome, this particular modification had only been mapped in 10 to 15 percent of transfer RNAs, and with our method were able to map pretty much all of them. It's greatly accelerating the pace of discovery," Lowe said. Lowe noted that this project capitalized on the expertise at UC Santa Cruz in two major areas, RNA biology and genomics. 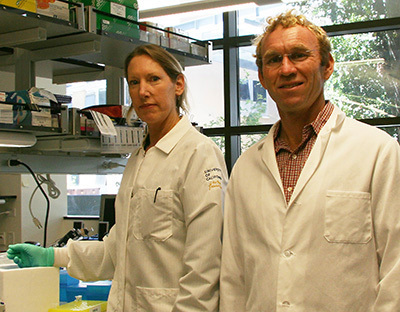 His lab is affiliated with both the UC Santa Cruz Genomics Institute and the Center for Molecular Biology of RNA. In addition to Cozen and Lowe, the coauthors of the paper include Andrew Holmes and Eva Robinson at UC Santa Cruz and Erin Quartley and Eric Phizicky at the University of Rochester School of Medicine. This research was supported by the National Institutes of Health.